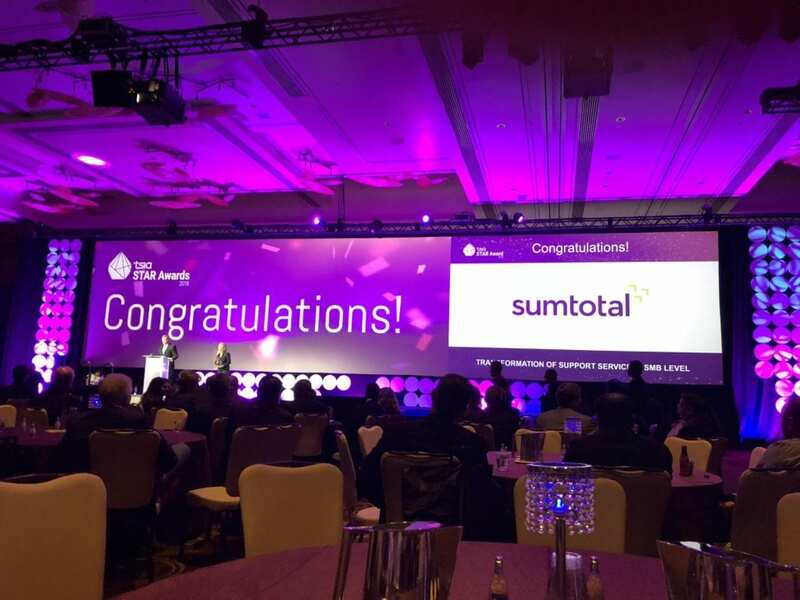 BOSTON – November 5, 2018 – SumTotal Systems, a Skillsoft company, today announced that it won the Transformation of Support Services category in the Technology Services Industry Association (TSIA) STAR Awards. This award recognizes the company that has transformed their support services organization to keep pace with industry digital transformation. TSIA, the leading association for today’s technology and services organizations, announced the winners of its 2018 STAR Awards on October 17 at the Technology & Services World conference in Las Vegas. Since its inception in 1990, the STAR Awards have become one of the highest honors in the technology services industry, recognizing commitment to outstanding innovation, leadership and excellence. Companies seeking the STAR Award undergo a rigorous evaluation process, with the winners selected by TSIA’s service practice advisory board members. SumTotal wins TSIA STAR Award for Transformation of Support Services. Understanding the importance of technology-led, frictionless customer support, SumTotal transformed its support operations across tools, processes and customer interaction with an overarching focus on improving response and resolution times. At the outset, SumTotal leveraged TSIA industry benchmarks to develop success metrics to guide the optimization of its support model. As a first step, SumTotal focused on minimizing customer effort required to attain appropriately aligned support resources while also leveraging tools, technologies and analytics to improve customer support communications. SumTotal developed a self-service Knowledge Management portal and the mySupport mobile app, the first customer support app developed for the corporate learning industry. Both self-service platforms enable customers to directly resolve or triage a wide variety of issues on-demand. The mySupport mobile app also provides customers with a transparent view into metrics such as site status and availability, case activity and more, delivering a single, end-to-end destination for all support and service needs. SumTotal serves hundreds of the world’s largest companies in highly regulated industries such as pharmaceuticals, financial services and aviation. As SumTotal helps customers run mission critical operations, the need for rapid customer support response and resolution is paramount. For example, in the aviation industry, SumTotal powers flight attendant FAA training for three of the world’s five largest airlines where planes are grounded if compliance is not met, underscoring the need for seamless SumTotal customer support. SumTotal’s customer support transformation will continue with additional self-service platform enhancements as well as plans to embed support capabilities directly into the SumTotal platform.